See An Antique Printing Press In Action. And Take Home A Souvenir. 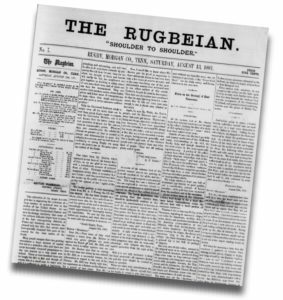 One of the first things the original settlers of Rugby did was to start their own newspaper, The Rugbeian. It was originally printed in Cincinnati and shipped in by train. But on July 2, 1881, Rugby started to print its newspaper locally, continuing for years. 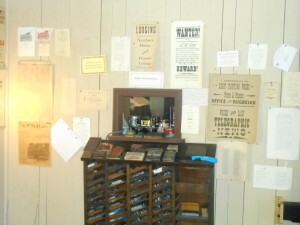 Rugby has an operating print shop with volunteers demonstrating printing. Today, you can still see how printing was done in the early days of the colony, at the Rugby Printing Works. The present day Rugby Printing Works is housed in a building built in 1887 in nearby Deer Lodge, Tenn., to house the local newspaper there, the Southern Enterprise. That paper and a successor lasted only until 1916, after which the building was used for a variety of unrelated purposes, mostly for storing animal feed and hay. Fortunately the interior was not altered nor was the ornate exterior, although a shed was added to the rear and a metal roof replaced the original wood shingle roof. In 1978, Historic Rugby acquired the building and in late 1979 moved it the 16 miles to Rugby, placing it on a sound foundation and taking steps to otherwise stabilize it. (The shed addition was removed prior to the move). The hand-cut foundation stones came from an 1880s store in nearby Allardt, Tenn., that were donated by Charles Choate. Since then, The Historic Rugby Printing Works has been in operation printing thousands of pieces each year, including greeting cards, menus, bags, sales receipts, books, and other items. You can see the press in operation on Saturdays and Sundays from March through December. Watch as skilled craftspeople keep the art of printing alive, and learn how early newspapers were created. It’s a fascinating experience, and it’s free to everyone who visits. And be sure to pick up your free souvenir printed in Historic Rugby. Visitors can tour the Rugby Printing Works every Saturday from 10 a.m. to 4 p.m. and on Sundays from 1 p.m. to 4 p.m. Eastern time. Step back in time–with an actual issue of Rugby’s newspaper, The Rugbeian. So test your knowledge: Who was the president on August 13, 1881?